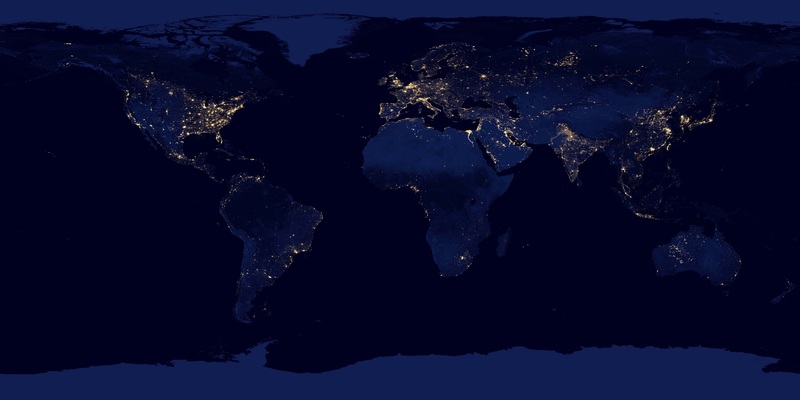 The nighttime view of Earth in visible light was made possible by the “day-night band” of the Visible Infrared Imaging Radiometer Suite. VIIRS detects light in a range of wavelengths from green to near-infrared and uses filtering techniques to observe dim signals such as gas flares, auroras, wildfires, city lights, and reflected moonlight. 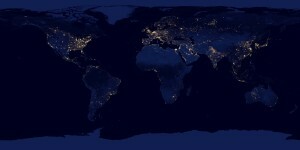 In this case, auroras, fires, and other stray light have been removed to emphasize the city lights. Named for satellite meteorology pioneer Verner Suomi, NPP flies over any given point on Earth’s surface twice each day at roughly 1:30 a.m. and 1:30 p.m. The spacecraft flies 824 kilometers (512 miles) above the surface in a polar orbit, circling the planet about 14 times a day. Suomi NPP sends its data once per orbit to a ground station in Svalbard, Norway, and continuously to local direct broadcast users distributed around the world. The mission is managed by NASA with operational support from NOAA and its Joint Polar Satellite System, which manages the satellite’s ground system.